After hearing criticism for having a workforce that does not reflect the city's ethnic and racial diversity, the City of Elk Grove last night agreed to undergo an employment audit. During public comment at Wednesday night's City Council meeting, seven people criticized the lack of diversity on the City's workforce. Common among the criticism was that even though Elk Grove is considered one of the most diverse in the country, that diversity is not reflected in the City staff, particularly among the executive team. Seizing on the in-congruence between the City's population and that of its work force, Elk Grove resident Amar Shergill said a more diverse workforce would better serve residents. "The City staff works better when it looks like the people it serves," he said. Also speaking was the Sacramento Chapter President of the NAACP Betty Williams who said she could not understand the lack of diversity given the make-up of the City. Williams also urged the City to undertake an audit of the city's workforce and hiring practices. "I am asking you to do an audit," Williams said. "The City needs to do better, and I don't understand why you are not." The City's executive team which includes the City Manager, Assistant City Manager, City Attorney, Director of Finance, Budget Manager, Public Works Director, Planning Director, Police Chief and City Clerk are all white. A so-called majority-minority city, whites make up roughly 40-percent of the City's population depending on Zip Code. 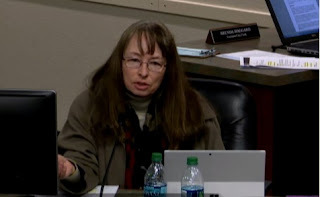 Although the item was not on the agenda, after hearing the comments, Mayor Steve Ly asked City Manager Laura Gill about the possibility of doing an audit of the City's staffing and hiring practices. Gill acknowledged the disparity, said City staff is trying to rectify the situation and was willing to undergo an audit. "We recognized that we are not as diverse as we would like to be," Gill said. "We are working to make connections into different communities to strengthen that partnership." Gill said she was willing to undergo an audit but added with only 300 City employees, if a minority employee ends leaves, the numbers are quickly skewed. Fabrizio Sasso of the Sacramento Central Labor Council, who also spoke during public comment, said after the meeting he was pleased the City Council sought an audit of its workforce. However, he pointed to the irony that three weeks ago the City Council was unwilling to conduct an audit on elections on the basis that protected classes of people are not represented on the City Council. "Tonight, we asked the City Council to direct staff to conduct an audit on diversity withing the City workforce, and they immediately agreed," Sasso said. "The question I have is why is it they care about diversity when it comes to others people's jobs but don't care when it investigates their own." This audit regarding the diversity, or lack of diversity, of the city's workforce will undoubtedly raise the hackles of the anti-affirmative action audience, but it is a step in the right direction. Having said that, it would be better if the city's audit was conducted with direct citizens' oversight. If not, the city manager will report the numbers, the council will hear the report and then toss it in the circular file. At a minimum the city manager and police chief need to provide quarterly updates to the council and document efforts the solve this problem. And it will be up to the council to hold their feet to the fire. At the League of Women Voters forum during the last election, the moderator asked, “Why aren’t there women of color in the Elk Grove Police Department? The answer, by a sitting Elk Grove City Council member was, “Because they aren’t any qualified women out there.” Really, no women of color qualified? Herein lies a larger problem and speaks to culture at the city of Elk Grove. There isn’t one person of color on city’s manager’s Laura Gill’s “executive team!” Why is that? Let me speculate: There aren’t any people of color qualified. Really now?